As I am graduating from college this year, I have been the constant recipient of one ominous question: “What are you going to do with your life?” I am getting exhausted with this question, because I have no idea how to answer it. A year ago, I had grand plans of things I wanted to do. But, life has a way of changing things suddenly and, despite my best efforts, my plans have become somewhat unraveled. Although I am incredibly task-oriented, I have been forced to do something which I find a bit uncomfortable: have no plans for my future following graduation. While I have the utmost respect for people who are able to go to rural areas of developing countries for work, I do not think that this would be an appropriate place for me to spend an extended amount of time. I recognize that my concerns are so trivial in comparison to the major issues of the world, that I hate to expose them (in fear that they might diminish my blog): I feel deprived if I do not get internet access on my phone. Now that I have a Twitter account, this dependency has gotten even worse. If you see me walking around campus, it is often with my Android in hand, devouring the news and current events posted on my Twitter feed. I chose this book for the Global Book Challenge after having read some pretty heavy material about countries in the Middle East. I decided that I would like to read a more casual book – perhaps a memoir. To be quite honest, this was a mistake. I eventually chose this book, based on the description. The format is a letter format, as the author writes about her experiences and challenges abroad living in Kyrgyzstan, where she works as an English language teacher as a Peace Corps volunteer. Emily Ross’s book shares what it is like for someone to move to another country without knowing the language – taking language courses, having problems going out to buy things, and bonding with other US nationals with similar experiences. She shares her own personal growth – growing more confident in herself and her abilities. There is a place for a book such as this. 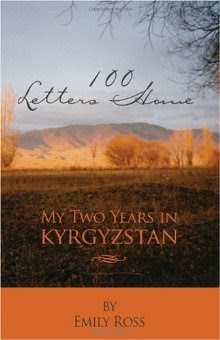 However, it is not the best book if you want to gain knowledge about the issues facing a country such as Kyrgyzstan. I learned nothing about the government or current challenges in society. On the other hand, I did not learn anything really positive or unique about the Kygryz people, as the author did not have anything very positive to say in her letters home. Instead, she would express her frustration with certain issues, such as the meat served at every meal (she starts her Peace Corps as a vegetarian), the lack of privacy in her home stay, and the importance of alcohol at social functions. She spent about half of the book, stating her overwhelming desire to return home, but in the Afterword, she said that she was happy she stayed after all was said and done. I am hoping to find another book about Kyrgyzstan, which I can read and write a new review (which would subsequently replace this one.) If you have any suggestions, please let me know! Also, please feel free to comment on these topics or note something interesting from the book. I look forward to hearing your opinions!